In the most Oprah-worthy development that had ever happened to this blog I received a comment on one of my “Old Photos” posts displaying several family Christmas images from 1945 taken in Neosho Rapids, KS. I’m John, the center baby in the 7th photo. Everyone in the photo is still living. Betty, the lady on the right, turned 90 this year. I mentioned before that my sincere hope is to hear from real people who either recognize a person, a place or an episode shown in the picture and so far it had only happened once. I just had to email John to find out more about the 65-year-old photo-shoot and he graciously answered my questions and even allowed to use his family photo for this post. I wanted to know how did the Life Magazine find the Irwin Family in a small Kansas town and if the Life Magazine article and photos are still cherished by the family members. My grandmother, who is shown in the photo preparing the goose, wrote a local column covering Neosho Rapids news for the Emporia Gazette, a Pulitzer Prize-winning newspaper ran by William Allen White. The Gazette (and other midwest newspapers) received an inquiry from Life Magazine about any families which had servicemen returning home from WWII. The Irwin family was chosen because it had members from all branches of the service; Army, Navy and Air Force (which was a branch of the Army at that time). Additionally, a son-in-law, Clyde Roush, was MIA (he never returned). The photo shoot took two or three days in late November or early December, 1945. The article appeared as a 5-page spread in the 12/24/45 issue of Life. Of course, millions of copies were circulated all over the world. My grandparents received tons of mail about the article and my grandmother kept pen pals as a result of the article well up until the 1960’s. My aunt Betty Roush even received scam letters from prisoners here in the US claiming to know the whereabouts of her MIA husband. For myself, the article was my only “fifteen minutes of fame” and I got it all when I was 3 months old. James F Irwin died in 1982 and his wife, Garland Irwin, died in 1994. All the children and grandchildren in the article are still living with the exception of Jim Irwin (on left in the photo below), who died in a tractor accident in 1992. Garland’s brother, Fred Andrews (on right in the photo below) a Navy CPO, died in 1970. A son-in-law, Jeff Haney (second from left in photo below) died in 1988. The home where the photo shoot took place was built in 1877 and is still occupied to this day, although not by the Irwin family. At the time of the shoot, the home had no indoor plumbing which was no doubt quite a shock to the photographer from New York. The family had “right of first refusal” to buy the home back when it changed hands about 2000, but declined. Most all family members, including grandchildren who weren’t born yet, have a copy of this 12/24/45 Life Magazine. I have several dozen copies myself. Life sent most of the participants enlargements of the photos, including many out takes. 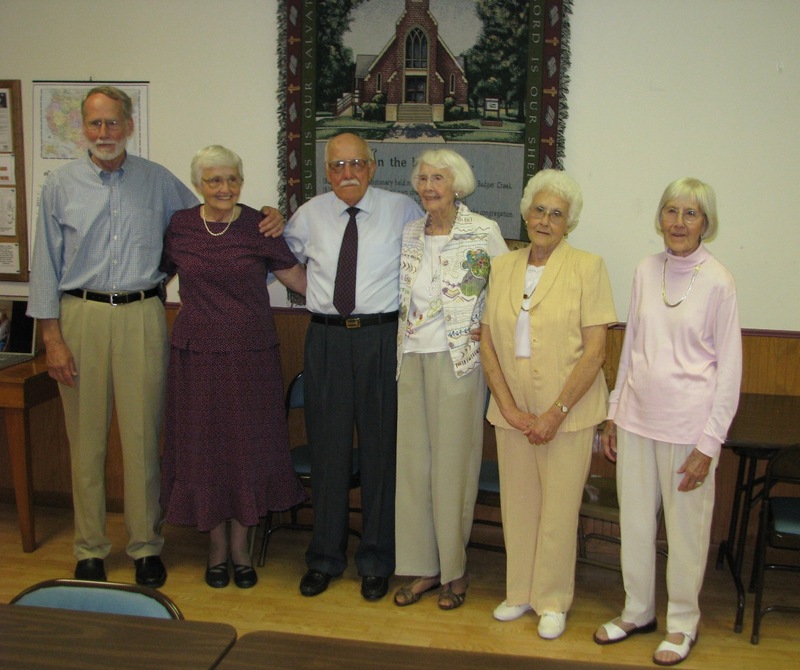 Left to right: Scott, Carolyn, Jack, Jeanne, Myra Lee, Betty. The 3 ladies on the right are in same order as in the photo below. Interestingly enough, my grandmother said a large share of the fan letters she got concerned the hides hanging on the wash house wall. Note the irregularly broken rail track used for cracking walnuts. She even got letters about that. We used that piece of track for an anvil on our farm all the time I was a kid growing up. I’d like to thank John for what turned out to be one of the most exciting and touching comments on this blog and for the glance at the Irwin Family history. I’ve been posting old photos from the Life Magazine archives for some time now and I am still amazed at how the photographers were able to tell a story and connect with the readers while not using all the multimedia bells and whistles we can no longer live without. Quality photographs, interesting subjects, real people – that’s what made the Life Magazine relevant then and that’s what makes it interesting now, like a full-page window into the yesteryear. For more Old Photos posts start your search here. *John’s text was slightly edited to match the order of photographs.